The M'Zab valley is located in Algeria, in the heart of the Sahara desert 600km south of Algiers. Five ksour (fortified villages) are in the oasis: El-Atteuf, Bounoura, Melika, Ghardaia and Beni-Isguen. 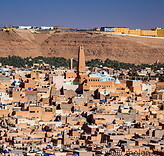 These villages are surrounded by palm groves and were founded between 1012 and 1350 by the Mozabites, a Muslim Ibadi sect of Berbers, who are distinct from Sunni or Shia Muslims. The only way to get to Ghardaia is by road, either by car or by bus. A good paved road connects Ghardaia to northern Algeria. 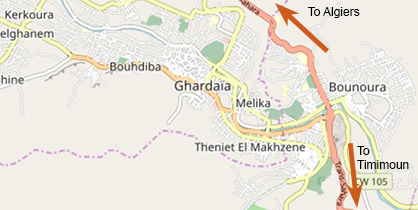 There are several hotels in Ghardaia, but only a few are bookable online.